Molly is an incredibly happy and fun loving 7 year old standard poodle. Molly’s days of playing fetch and running on the beach were put on hold in April of 2012 when she tore her right Cranial Cruciate Ligament (or CCL, the equivalent to our ACL). Molly underwent a surgical procedure known as a tibial plateau leveling osteotomy (TPLO) to stabilize her stifle on 4/13/12. After her surgery, Molly recovered excellently! 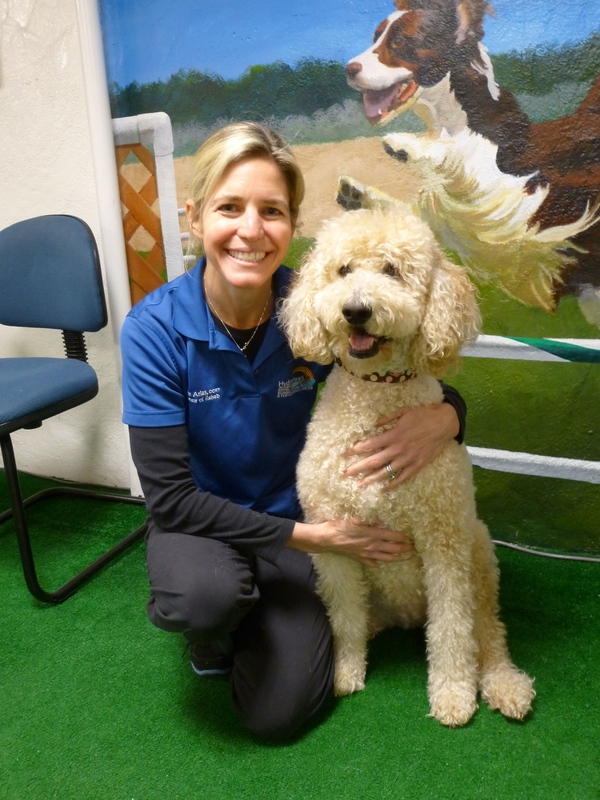 She came to HydroPaws for underwater treadmill therapy, cold laser therapy, and as she progressed we added in land-based therapeutic exercises. She was just a step away from being fully recovered in July of 2012 when she tore her left CCL. This is unfortunately a common occurrence in dogs as most tear their CCL because of a conformation issue and not a traumatic injury. If one stifle is predisposed to a tear then the other stifle usually is as well. Molly underwent a second TPLO on 7/18/12 and then returned to HydroPaws to rehabilitate her left hindlimb. This time around, Molly was a pro at all of our different exercises! She received cold laser therapy, would walk and progressed to trotting in the underwater treadmill, and excelled at different land-based therapeutic exercises. Now that Molly has successfully rehabilitated both of her stifles, she is finally able to get back to doing all the things she loves to do! Molly loves going on long walks, playing with her ball, and running on the beach!